A Rabbi, in Judaism, is a religious teacher and, in modern times, the leader of a synagogue. The term was first applied in Jewish sources to the early Talmudic sages of the late first and second centuries C.E. With the destruction of the Temple of Jerusalem in 70 C.E., the Jewish teachers of the Law of Moses known as the Pharisees replaced the temple priests as the primary religious authorities of Judaism. Following their tradition, as codified in the Talmud, local synagogue leaders gradually assumed the role which would come to be known in later times as the rabbinical office. Qualifications for rabbinical ordination differ among the various Jewish traditions. Some Hasidic groups still reserve the term Rabbi only for the great, acknowledged sages, while most other types of Judaism have adopted the term for any ordained teacher of Jewish law. In modern times, the role of rabbis has often come to resemble that of Protestant pastors: acting as sermon-givers, organizers, counselors, and community spokesmen, as well as the traditional role of teachers and interpreters of religious law. Women are now ordained in Reform, Reconstructionist, and most Conservative communities, but not in Orthodox or Hasidic ones. The word "Rabbi" is derived from the Hebrew root word רַב, rav, which in biblical Hebrew means great or distinguished. Sephardic and Yemenite Jews pronounce it, ribbī, while the modern Israeli pronunciation rabbī is derived from eighteenth century Ashkenazic (northern European) tradition. Other varieties of pronunciation are rəvī, rubbī, and, in Yiddish, rebbə. The governments of the kingdoms of Israel and the Kingdom of Judah were based on a system of kings, prophets, and the priests, and also a council of legal advisers known as the Sanhedrin. Although the word sanhedrin comes from the period of Greek rule over the land of Israel, members of this council were supposed to represent an uninterrupted line from the 70 elders appointed by Moses to assist him in settling various legal cases (Exodus 18: 24-26). They were usually referred to as judges (dayanim), not rabbis, but it is from this institution that the rabbinic office evolved. Jesus among the teachers. The term "rabbi" may have first come into use in the first century C.E. 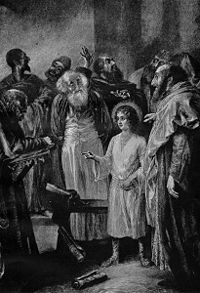 In the Second Temple period, from the end of the Babylonian Exile until 70 C.E., the Sanhedrin had the authority to interpret religious law and sometimes civil law as well, depending on the administration under which it operated. During the Roman period, local sanhedrins sometimes functioned as town councils, in addition to the Great Sanhedrin in Jerusalem. The parties of the Pharisees and Sadducees vied for dominance in the Sanhedrin, with the Pharisees emphasizing popular piety in addition to Temple attendance, while teaching a concept of an Oral Torah as well as a written Law of Moses. The Pharisees would ultimately predominate, and it is from their tradition that the rabbis would eventually emerge. Christian sources indicate that Jesus of Nazareth (Mark 9:5, etc.) and other Jewish teachers were called "Rabbi" by their followers. Even if the title of Rabbi had come into use only by the time the Gospels were written in the late first century C.E., this would indicate that the term was already a title of honor in normative Jewish communities by the late first century C.E.. If the Christian recollection of Jesus himself being called "Rabbi" is accurate, then the title would have been in use by the first part of the first century C.E., and perhaps earlier. With the destruction of the Temple in Jerusalem, the Jewish priesthood became an obsolete office. The focus of scholarly and spiritual leadership among the Jewish people thus shifted almost entirely to the sages of the Sanhedrin, reconstituted in the town of Yavneh (Jamnia). This assembly was composed by the earliest "rabbis" as we know them. This group began the formal development and explication of what became known as Judaism's "Oral Law. This was eventually encoded within the Mishnah, the Talmud, and subsequent rabbinical scholarship, producing what is known today as "Rabbinical Judaism." Meanwhile, at the local level, the synagogue replaced the Temple as the primary focus of spiritual energy, reinforcing the Talmudic tradition. 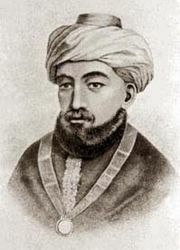 The first time the word "Rabbi" is mentioned in Jewish sources is in the Mishnah, commonly thought to be codified around 200 C.E., by Rabbi Judah Ha Nasi. In the Mishnah, the title was first used for Gamaliel the Elder (mid first century C.E. ), Rabban Simeon his son, and Rabban Johanan ben Zakkai, all of whom were patriarchs or presidents of the Sanhedrin. Many of the other Talmudic sages were referred to either as Rabbi (the Palestinian form) or Rab (the Babylonian form). Whether the title was used informally on a wider basis during this time is not known for certain. 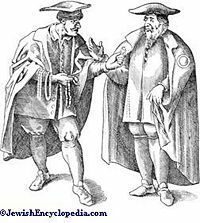 In the medieval period, Maimonides held that every congregation was obliged to appoint a preacher and scholar to admonish the community and teach the Torah, and the social institution he described was the germ of the modern congregational rabbinate. In the fifteenth century in Central Europe, the custom grew up of licensing scholars with a diploma entitling them to be called Mori (my teacher). Thus, the office, though probably not the title, of "rabbi" was clearly in place by this time. Traditionally, a man obtains semicha (rabbinic ordination) after the completion of an arduous learning program in the codes of halakha (Jewish law) and responsa (written opinions by legal scholars). Most Orthodox rabbis hold this ordination, qualifying them primarily as teachers of the authentic Jewish tradition. They are sometimes called a moreh hora'ah ("a teacher of rulings"). A more advanced form of semicha is Yadin yadin ("he shall judge"). This enables the recipient to adjudicate cases of monetary law, among other responsibilities. He is addressed as a dayan ("judge"). Few rabbis earn this ordination. Many Orthodox rabbis hold that a beth din (court of Jewish law) should be made up of dayanim. Since the advent of Reform Judaism in the nineteenth century, the qualifications, duties, and authority of a rabbi vary according to the type of Judaism which the rabbi practices. An Orthodox rabbi studies the Talmud with his fellow Jews. Orthodox rabbinical students work to gain knowledge in Talmud, the early and late medieval commentators and Jewish law. They study sections of the codified Jewish law and its main commentaries that pertain to daily life questions such as the laws of keeping kosher, Sabbath laws, marriage and divorce, and the laws of sexual and family purity. Orthodox rabbis typically study at dedicated religious schools known as yeshivas. Modern Orthodox rabbinical students, such as at New York's Yeshiva University, study some elements of modern theology or philosophy, as well as the classical rabbinic works on such subjects. The entrance requirements for an Orthodox yeshiva include a strong background within Jewish law, liturgy, Talmudic study, and attendant languages (e.g., Hebrew, Aramaic and in some cases Yiddish). Since rabbinical studies typically flow from other yeshiva studies, those who seek a semicha are typically not required to have completed a university education. There are some exceptions to this rule, including Yeshiva University, which requires all rabbinical students to complete an undergraduate degree before entering the program and a Masters or equivalent before ordination. 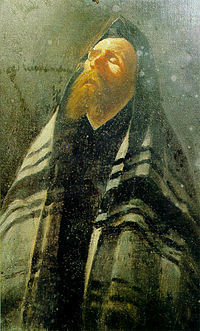 Rabbi Israel ben Eliezer (1698 – 1760) is considered to be the founder of Hasidic Judaism. While some Hasidic yeshivas grant official semicha ("ordination") to students wishing to become rabbis, most of the students within these yeshivas engage in Torah or Talmud studies without the goal of becoming rabbis. The curriculum for obtaining semicha as rabbis for Hasidic scholars is the same as described above. Women do not, and cannot, become "rabbis" in Orthodox Judaism, whether of the Hasidic variety or otherwise. Within the Hasidic world, the positions of spiritual leadership are dynastically transmitted within established families, usually from fathers to sons. The common use of the title of "Rabbi" is sometimes derided by Hasidim, because this term is reserved only for great sages. Hasidim will therefore prefer using Hebrew names for rabbinic titles based on older traditions. Often the plain Reb form is used, which is a shortened form of rebbe a respectful title that can be applied applied to any married Jewish male. 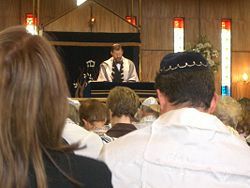 Conservative Judaism, which grew out of a response to the perceived overly liberal attitude of the movement of Reform Judaism on issues of Jewish law, holds that one may obtain rabbinic ordination after the completion of a rigorous program in the codes of Jewish law and responsa in keeping with Jewish tradition. It specifies the study of: the Hebrew Bible, the Mishna and Talmud, the Midrashic literature, Jewish ethics and lore, the codes of Jewish law, the literature of Conservative Jewish tradition, and modern Jewish works on theology and philosophy. Conservative Judaism has less stringent study requirements for Talmudic studies compared to Orthodoxy but adds additional requirements for rabbinic ordination: pastoral care and psychology, the historical development of Judaism, and academic biblical criticism. Entrance requirements to a Conservative rabbinical study include a strong background within Jewish law and liturgy, knowledge of Hebrew, familiarity with rabbinic literature, Talmud, and the completion of an undergraduate university degree. Rabbinical students usually earn a secular degree (e.g., Master of Hebrew Letters) upon graduation. Ordination is granted at the Ziegler School of Rabbinic Studies in Los Angeles, the Rabbinical School of the Jewish Theological Seminary in New York, the Schechter Institute for Jewish Studies in Jerusalem, the Jewish Theological Seminary of Budapest and the Seminario Rabinico Latinoamericano in Buenos Aires, Argentina. Conservative seminaries are now ordaining female rabbis and training female cantors. There are still traditional Conservative congregations, however, that resist this movement. Reform and Reconstructionist rabbis learn less Talmud and Jewish legal tradition than in Orthodox or Conservative seminaries. However, they often are required to study more in other areas such as sociology, cultural studies, modern Jewish philosophy, and pastoral care. The Reform and Reconstructionist rabbinical seminaries require students to earn a bachelor's degree before entering the rabbinate as well as have a basic knowledge of Hebrew. Studies are mandated in pastoral care and psychology, the historical development of Judaism, and academic biblical criticism. In addition, practical rabbinic experience, such as working at a small congregation as a student rabbi one weekend a month or interning at a larger synagogue as a student rabbi is required. The seminary of Reform Judaism is the Hebrew Union College-Jewish Institute of Religion. It has campuses in Cincinnati, New York City, Los Angeles, and in Jerusalem. 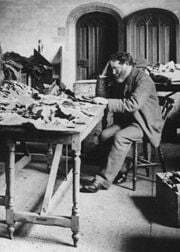 In the United Kingdom the Reform and Liberal movements maintain Leo Baeck College for the training of rabbis. The rabbinical college for Reconstructionist Judaism is called the Reconstructionist Rabbinical College and is located in Wyncote, Pennsylvania, just outside Philadelphia. In contemporary Reform and Reconstructionist Judaism, both men and women may be rabbis. 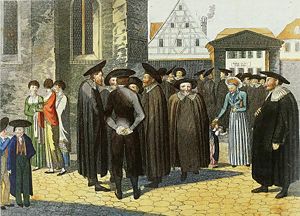 In nineteenth century Germany and the United States, the duties of the rabbi became increasingly influenced by the duties of the Protestant Christian Minister. Sermons, pastoral counseling, and representing the community to the outside world all increased in importance. Non-Orthodox rabbis, on a day-to-day business basis, now spend more time on these traditionally non-rabbinic functions than they do teaching or answering questions on Jewish law and philosophy. Within the modern Orthodox community, rabbis still mainly deal with teaching and questions of Jewish law, but they are increasingly dealing with these same pastoral functions. Orthodox Judaism's National Council of Young Israel and Modern Orthodox Judaism's Rabbinical Council of America have set up supplemental pastoral training programs for their rabbis. Traditionally, rabbis have never been an intermediary between God and man. Nor do they function as priests, that role having become at least temporarily obsolete since the destruction of the Temple of Jerusalem. With the exception of knowledge and, hopefully, wisdom, they are not considered to be imbued with special powers or abilities. All rituals in Judaism can be performed by any Jew of age, except that certain functions are reserved to males or females. In an ironic twist, the secular system in most states requires that a Jewish wedding be performed by an ordained rabbi in order to be legally recognized, even though there is no such requirement in Jewish law. In other words, the secular system treats Rabbis as the Jewish equivalent to Catholic Priests or Protestant Ministers, although they are not religious equivalents. Historically and until the present, recognition of a rabbi relates to a community's perception of the rabbi's competence to interpret Jewish law and act as a teacher on central matters within Judaism. More broadly speaking, it is also an issue of being a worthy successor to a sacred legacy. As a result, there have often been greater or lesser disputes about the legitimacy and authority of rabbis. As a practical matter, communities and individuals typically tend to follow the authority of the rabbi they have chosen as their leader on issues of Jewish law. They may recognize that other rabbis have the same authority elsewhere, but for decisions and opinions important to them they will work through their own rabbi. The divisions between the various branches within Judaism manifest strongly on questions of whether rabbis from one movement recognize the legitimacy and/or authority of rabbis in another. Rabbis within Orthodoxy, and to a lesser extent within Conservative Judaism, are reluctant to accept the authority of other rabbis whose halakhic standards are not as strict as their own. In some cases, this leads to an outright rejection of the legitimacy of other rabbis; in others, the more lenient rabbi may be recognized as a spiritual leader of a particular community but may not be accepted as a credible authority on Jewish law. The Orthodox rabbinical establishment rejects the validity of Conservative, Reform and Reconstructionist rabbis on the grounds that these movements' teachings are in violation of traditional Jewish tenets. Conservative rabbis accept the legitimacy of Orthodox rabbis, although they are often critical of Orthodox positions as out of date. On the other hand, they tend to reject Reform or Reconstructionist rabbis' opinions as too lenient on matters of Jewish law and tradition, but they accept the legitimacy of these rabbis' religious leadership. Reform and Reconstructionist rabbis accept the legitimacy of other rabbis' leadership in their own communities, but reject their views on Jewish law, which is seen as an evolving tradition, many aspects of which no longer apply today. These debates cause great problems regarding the recognition of Jewish marriages, conversions, and other life decisions that are touched by Jewish law. Orthodox rabbis do not recognize marriages and conversions by non-Orthodox rabbis. While most Conservative rabbis recognize Reform and Reconstructionist marriages and conversions, there are some who do not. Finally, the North American Reform and Reconstructionist movements recognize patrilineality as a valid claim of Judaism, whereas Conservative and Orthodox maintain the position expressed in the Talmud that one can be a Jew only if one is born of a Jewish mother or formally converts to Judaism. The State of Israel, in which Orthodox Jews control an important political party, recognizes only the legitimacy of Orthodox rabbis. In Jewish tradition, it has been the longstanding practice that only men become rabbis. This practice is continued to this day within the Orthodox community. However, since the 1950s, the non-Orthodox organizations—including the Reform, Reconstructionist, and Conservative movements—gradually began to grant semicha to women on an equal basis with men. Today there are hundreds of women who hold official ordination as rabbis, including many who lead large congregations. The issue of allowing women to become rabbis is not under active debate within the Orthodox community, although there is widespread agreement that women may often be consulted on matters of Jewish religious law. Several efforts are underway within Modern Orthodox communities to include qualified women in activities traditionally limited to rabbis. There have also been reports that a small number of Orthodox yeshivas may have unofficially granted semicha to women, but the prevailing consensus among Orthodox leaders and a small number of Conservative communities is that it is not appropriate for women to become rabbis. Academy for Jewish Religion (non-denominational seminary). ajrsem.org. Hebrew Union College - Jewish Institute for Religion (Reform seminary). huc.edu. Hebrew College - The Rabbinical School at Hebrew College (Transdenominational seminary). hebrewcollege.edu. The Jewish Theological Seminary of America (Conservative seminary). www.rrc.edu. Yeshiva University (Centrist-Modern Orthodox seminary). yu.edu. Yeshivat Chovevei Torah (Liberal-Modern Orthodox Seminary). www.yctorah.org. This page was last modified on 22 June 2015, at 17:38.